Livre sur le Tanganyika ! A paraitre la 3ième édition du livre de Ad Konings sur le Lac Tanganyika ! Re: Livre sur le Tanganyika ! on peut précommander chez Eric ? On sait si une édition française verra le jour? Et petit HS pour Benoît : il est toujours d'actualité ton projet de DVD? Sûrement pas! C'est son avis, il est respectable, mais pas forcément respecté. En l'occurrence, il y aura en effet beaucoup de prises de position complètement absconses, j'en ai discuté avec lui sans réussir à le convaincre. Il devra rapidement admettre une fois de plus que les faits lui donnent tort. Par exemple pour les Tropheus que j'ai présentés comme espèces distinctes dans mon article: il n'a rien voulu savoir à l'époque, or ces Tropheus sont en cours de description... Idem pour plusieurs Petrochromis, pour lesquels il a fait marche arrière par rapport à ses propres positions. Lui qui était révolutionnaire à ses débuts (à juste titre), il devient réactionnaire. The total number of species discussed in this book is 219. There have been numerous taxonomic changes since the previous (1998) edition, and these have been properly discussed in the text and are listed below in alphabetical order of genus. Benthochromis: one new species described, B. horii Takahasi, 2008; the fish referred to as B. tricoti in earlier publications is now B. horii. Callochromis: the fish previously referred to as C. stappersi is now an undescribed species, C. sp. 'pleurospilus tanzania'. Cardiopharynx: an additional species, C. sp. 'kabimba', is identified. Chalinochromis: one new species described, C. cyanophleps Kullander et al., 2014, previously regarded as a form of C. popelini; the undescribed 'ndobhoi' form is now regarded as a variant of C. brichardi; C. sp. 'bifrenatus' is now recognized as distinct from C. popelini. Cyphotilapia: one new species described, C. gibberosa Takahashi & Nakaya, 2003, but synonymized with C. frontosa. Cyprichromis: two new species described: C. zonatus Takahashi, 2002 (previously C. sp. 'zebra') and C. coloratus Takahashi & Hori, 2006; three additional species identified: C. sp. 'leptosoma kitumba', C. sp. 'leptosoma kigoma', and C. sp. 'kibishi'. Ectodus: the 1998 E. sp. 'descampsi ndole' is corrected to E. descampsi, and the 1998 E. descampsi is now E. sp. 'north'. Eretmodus: E. sp. 'cyanostictus north' has been described as E. marksmithi Burgess, 2012. Greenwoodochromis: following Andersen (2014), the species abeelei and staneri (formerly in Limnochromis) are now placed in Greenwoodochromis. Haplotaxodon: the newly described species H. trifasciatus Takahashi & Nakaya, 1999, is not accepted here but synonymized with H. microlepis. Hemibates: a second species, H. sp. 'stenosoma zambia', is tentatively identified. Interochromis: new genus described by Yamaoka et al. (1998) to accommodate what was previously Simochromis loocki. 'Lamprologus': Lepidiolamprologus lemairii is returned to this genus; 'L.' wauthioni is now placed in Neolamprologus and the undescribed form 'L.' sp. 'shell zambia' is now tentatively identified as Neolamprologus wauthioni. Lepidiolamprologus: the fish previously referred to as L. hecqui is now L. meeli; a new species, L. kamambae Kullander et al., 2012, has been described but is regarded as a subspecies of L. kendalli; L. sp. 'profundicola tanzania' has been described as L. mimicus Schelly et al., 2007; L. lemairii has been returned to 'Lamprologus'. 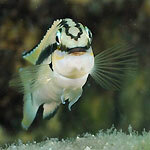 Limnochromis: the species abeelei and staneri are now placed in Greenwoodochromis. Neolamprologus: four new species described: N. cancellatus Aibara et al., 2005, N. chitamwebwai Verburg & Bills, 2007, N. walteri Verburg & Bills, 2007, and N. timidus Kullander et al., 2014. N. brichardi and N. crassus have been synonymized with N. pulcher; N. chitamwebwai Verburg & Bills 2007 is synonymized with N. falcicula; the fish previously regarded a variant of N. falcicula is distinguished as N. sp. 'falcicula cygnus'; the form known as N. sp. 'eseki' (Konings 2005) is referred to N. mondabu; the discovery of N. signatus along the central Tanzanian shore has led to recognition of N. laparogramma as a distinct species; N. longior, previously synonymized with N. leleupi, is restored to its original status as a subspecies of that species; N. cf. leleupi (1998) is now termed N. sp. 'leleupi kapampa'; N. petricola is synonymized with N. modestus; 'Lamprologus' wauthioni, which appears closely related to N. ventralis, is now placed in Neolamprologus; the new species N. cancellatus is not accepted as it is probably a natural hybrid between Telmatochromis vittatus and another species. Ophthalmotilapia: the fish previously identified as O. heterodonta appears to be an undescribed species, O. sp. 'paranasuta'. Perissodus: the genus Plecodus is synonymized with Perissodus; a deep-bodied Perissodus previously identified as P. eccentricus is now regarded as a form of P. microlepis. Petrochromis: one new species described, P. horii Takahashi & Koblmüller, 2014, which includes the form previously known as P. sp. 'gold'; P. sp. 'moshi yellow' is now included in P. ephippium; P. sp. 'giant', P. sp. 'kasumbe', P. sp. 'texas', P. sp. 'texas blue', P. sp. 'texas kipili', and P. sp. 'texas red' are now regarded as geographical variants of P. polyodon; P. sp. 'orthognathus tricolor' is now regarded as conspecific with Interochromis loocki. Pseudosimochromis: following Van Steenberge et al. (2015), three species formerly assigned to Simochromis, babaulti, marginatus, and margaretae, are now included in Pseudosimochromis. Simochromis: the genus is now monotypic (with S. diagramma), following the transfer to Pseudosimochromis of the three species babaulti, marginatus, and margaretae. Telmatochromis: one new species described, T. brachygnathus Hanssens & Snoeks, 2003, but synonymized with T. temporalis; T. sp. 'temporalis tanzania' is now included in T. temporalis; T. macrolepis is reinstated; three new species discovered: T. sp. 'schachbrett' (Büscher 1998b), T. sp. 'dhonti yellow', and T. sp. 'vittatus elongate'. Trematochromis: T. schreyeni was synonymized with 'Ctenochromis' benthicola (Takahashi et al. 2006) but the genus Trematochromis is retained here and the species referred to as Trematochromis benthicola. Tropheus: two new species, T. sp. 'lunatus' and T. sp. 'maculatus', have been identified (Van Steenberge 2014); T. sp. 'ikola' is included in T. sp. 'black'. Xenotilapia: the previous synonymization of X. boulengeri with X. sima is corrected; X. sp. 'fluorescent green' is included in X. nasus; X. sp. 'ochrogenys ndole' is conspecific with X. singularis; X. sp. 'papilio katete' is regarded as a geographical variant of X. papilio. N. crassus et brichardi synonymes de N. pulcher !!! D'où vient ce texte Laurent ? Benoit J. a écrit : N. crassus et brichardi synonymes de N. pulcher !!! la dinde, la poule, la pintade se ressemblent non ? Il est bientôt dispo en France ! oui, les photos sont superbes mais le papier ne les met pas en valeur ! C'est vraiment dommage ! l'impression ne rend pas hommage au travail effectué !